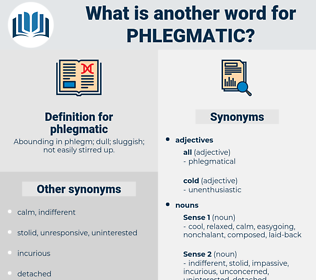 What is another word for phlegmatic? Abounding in phlegm; dull; sluggish; not easily stirred up. 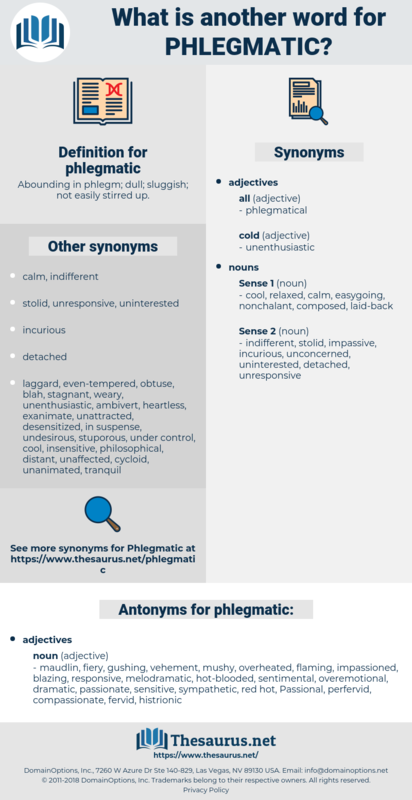 maudlin, fiery, gushing, vehement, mushy, overheated, flaming, impassioned, blazing, responsive, melodramatic, hot-blooded, sentimental, overemotional, dramatic, passionate, sensitive, sympathetic, red hot, Passional, perfervid, compassionate, fervid, histrionic, mawkish, warm-blooded, reactive, zealous. Individuals who are phlegmatic, matter - of - fact, and not very intense in their feelings might be inclined to ridicule this anxiety and suffering on the part of the parents, for so slight a cause; they would fail to understand it. Rue is best adapted to those of phlegmatic habit, and of languid constitutional energies.